Introduction to Tom Hudson. 1:45 min. Camera: Angelika Rinnhofer. Editor: John Perez Music: Carmen Cicero. Photo & Design: Raymond Elman. 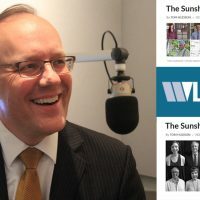 In a journalism career covering news from high global finance to neighborhood infrastructure, Tom Hudson is the Vice President of News and Special Correspondent for WLRN. He hosts and produces the Sunshine Economy and anchors the Florida Roundup in addition to leading the organization’s news engagement strategy. Tom also reported and anchored market coverage for the groundbreaking web-based financial news service, WebFN. Beginning in 2001, WebFN was among the first live online streaming video outlets. While there he reported regularly from the Chicago Board Options Exchange, Chicago Board of Trade and the CME. Tom writes a weekly column for the Miami Herald and the McClatchy-Tribune News Service. He appears regularly on KNX-AM/Los Angeles and WBBM-AM/Chicago for commentary on the economy and investment markets. INSIGHT & INSPIRATION: 1:47 min. Where did you grow up, and what was your earliest awareness of news reporting? UNDERSTANDS THE AUDIENCE’S PERSPECTIVE: 0:29 sec. Growing up, was there a point where you realized how much people value the news? What did you learn in school that still informs you today? EXPOSURE TO BROAD INFLUENCES: 0:44 sec. The University of Iowa is home to the famous Iowa Writers Workshop. Right? When did you know you wanted to be a broadcast journalist? INSIGHT & INSPIRATION: 1:32 min. Did you always have a resonant voice? UNDERSTANDS THE AUDIENCE’S PERSPECTIVE: 2:45 min. Radio went from being the only broadcast news medium, to being almost totally eclipsed by television, to making a major comeback as public radio. What are your thoughts about that cycle? Most of NPR’s callers sound intelligent and middle age or older. What is the relationship like between NPR and Millennials or people under 40? What are your thoughts about the concept that any inane piece of video might go viral? UNDERSTANDS THE AUDIENCE’S PERSPECTIVE: 0:44 sec. What do you do to try to give a balanced view of the news? In the past it was required that a broadcast channel give equal time to all sides of a political issue. That regulation seems to be long gone. INSIGHT & INSPIRATION: 2:14 min. What’s your opinion regarding the accusations of fake news, and the value of an independent press? INSIGHT & INSPIRATION: 2:12 min. Who have been your role models and influencers? UNDERSTANDS THE AUDIENCE’S PERSPECTIVE: 1:42 min. Do you receive pressure from politicians, lobbyists, and others to slant stories in their favor? DEVELOP A VOICE: 1:45 min. Inspicio reports on journalism as an art form, but I rarely hear journalists talk about their work as a form of art, even though there are many creative elements such as writing, photography, design, videography, etc. What was your path into business reporting? UNDERSTANDS THE BUSINESS OF ART: 3:04 min. How do you and WLRN view the podcast market? UNDERSTANDS THE AUDIENCE’S PERSPECTIVE: 3:26 min. Is most of your reporting live or on tape? And are most of your interactions face-to-face or remote? What do you do when you capture someone making an unflattering mistake during an interview? OVERCOMES CHALLENGES TO SUCCEED: 2:37 min. Who are the most difficult people to interview? OVERCOMES CHALLENGES TO SUCCEED: 2:42 min. Can you describe a challenging situation with a successful outcome? INSIGHT & INSPIRATION: 3:41 min. South Florida news institutions have seemingly reduced their reporting on the arts. Is that because of limited audience appeal or limited financial resources? Some of the running themes for Inspicio are climate change, sea level rise, and immigration, which cut across our art verticals (music, theater, visual art, architecture, etc.) just like art cuts across WLRN’s news verticals. Sebastian Junger, author of “The Perfect Storm,” opened a bar in New York called The Half King, to foster the kind of journalistic camaraderie that he experienced in war torn countries. Does anything like that exist in South Florida?